White-tail deer are often plentiful on the landscape. Even in areas that contain mostly elk and mule deer, whitetail often have a presence. We manage these animals for older age classes the same as our elk and mule deer. White-tail can be hunted separately as a stand-alone hunt or can be added on to an elk hunt. Success is 100% with most deer scoring 130-145 gross B&C with the largest bucks scoring 160-170 gross B&C. This 40,000 acre ranch is located 35 miles north of Big Timber, Montana, at the east slope of the Crazy Mountains. The terrain is typified by a small creek that flows through the land for 12 miles, with large cottonwood trees and brush lined with small hay and grain fields. Off the bottoms, the land turns to heavy breaks and rolling plains. The creek bottoms are excellent habitat for white-tailed deer and the rolling country is ideal for mule deer and antelope. The Glennie Ranch has very limited whitetail and mule deer hunting, with only 8 hunters a year. We expect hunters to kill white-tailed deer in the 130-160 class and mule deer in the 140-170 class. Hunters can harvest one antlered deer of either species. This ranch is located outside of Three Forks, Montana. The ranch is mostly arid with rolling to steep foothills that are sagebrush and juniper covered. There is a large contingency of grain on the property. 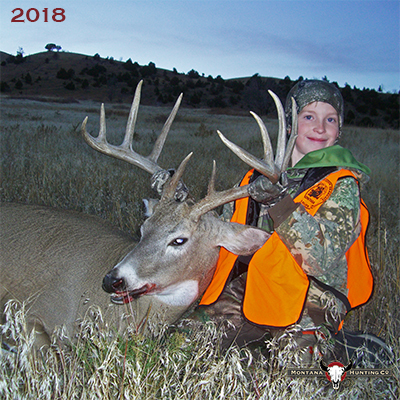 The ranch also has over 20 miles of Missouri River frontage offering outstanding fishing.Trophy whitetial bucks will score between 125-145+ gross B&C points. Trophy mule deer bucks will score between 140-160+. This ranch is also home to a small elk herd. The bull elk are hunted with a hard to draw permit. (Less than 1% draw for a non-resident) If you are fortunate enough to draw a special permit, you will have opportunites at outstanding elk. Lodging is included. This 35,000 acre ranch is located on both sides of the Jefferson River 30 minutes west of Bozeman, Montana. The terrain is typified by river bottoms with agriculture, cottonwoods and willows. The hills surrounding the ranch are arid with a juniper, sagebrush and grassland community of plants. Large mountain ranges are very close to this property making it very scenic. The river bottoms are all excellent habitat for white-tailed deer and the hill country is ideal for mule deer. The ranch has a small herd of good quality elk. Currently, we are offering hunters an opportunity to harvest them on a trophy fee basis. We expect hunters to kill white-tailed deer in the 120-160 class and mule deer should be in the 140-170 class. Hunters in Montana can harvest an antlered deer of either species. The large agriculture component keeps deer of both species very visible. Trout fishing is excellent in both the private ponds and the blue ribbon Jefferson River. This is great Turner Enterprises property. This 4,800 acre ranch is located on the Red Rock River bottom south of Dillon, Montana. The terrain is typified by river bottoms, cottonwood and willows, with limited agriculture. The river bottoms are excellent habitat for white-tailed deer. The Red Rock has very limited hunting pressure in the last few years. We expect hunters to kill white-tail deer in the 140-160 gross B&C class. Another Montana Turner Enterprises property. This 12,000 acre ranch is located on the Ruby River south of Alder, Montana. The terrain is typified by river bottoms, cottonwood and willows with limited agriculture. This property is typified by rough breaks that lead to the river bottoms. This property also has mule deer, but hunting is by permit only. The river bottoms are excellent habitat for white-tailed deer. We expect hunters to kill white-tailed deer in the 125-160 gross B&C. The Winnecook Ranch located in central Montana near Harlowtown, was purchased in 1992 by the Latter-Day Saints Church. It is operated as a working cattle ranch and comprises 50,000 acres (75 square miles) of dry farm, rangeland & river bottom. The Musselshell River winds through 5 miles of the ranch providing cover for more than 500 white-tailed deer. An additional 150 mule deer are located in the rough country above the river plain. Around 550 antelope occupy the rest of the rangeland and dry farm country with occasional sightings of moose, elk, and bear. Turkey, sharptails, Hungarian partridge, pheasant, ducks and geese are regulars on the ranch. Fishing for trout in the Musselshell can be excellent at times. Hunter success is at 100%.